I just loved how the Lemon & Yoghurt Cake turned out the other day. 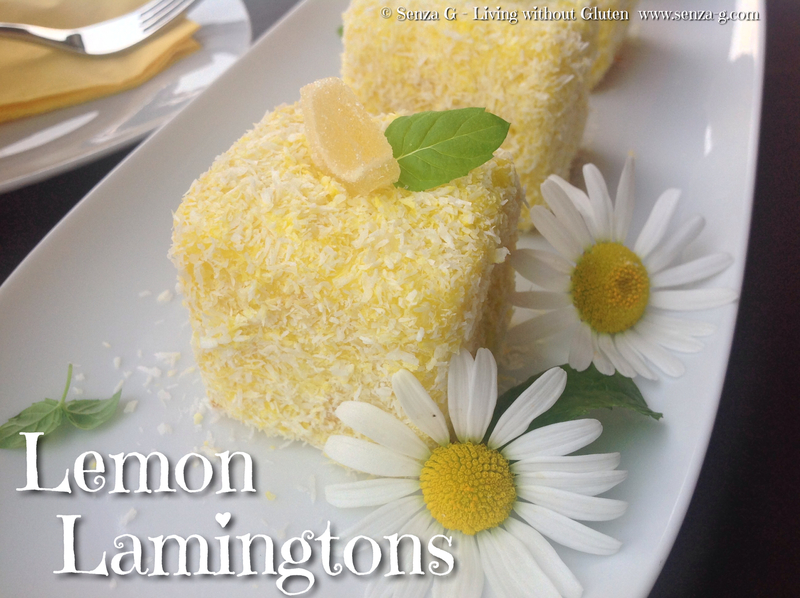 So I decided to make it again but this time turn it into Lemon Lamingtons. These are normally made with chocolate frosting or else strawberry or raspberry frosting. But since I love lemon flavouring and also as it would pair off really well with the lemon cake, I used Lemon Gluten Free and Sugar Free Jelly Crystals instead of using frosting and then rolled into coconuts. Result ? You have got to try them out and see for yourselves! Make the lemon and yoghurt cake but instead of baking in a loaf tin, bake in a square baking tin. Once it is baked, remove the crust and cut into cubes. With the leftovers, you can make truffles or cake pops! You can also use a ready baked Gluten Free Sponge Cake should you not wish to bake. Now here is how to prepare the jelly coating. Pour the boiling water in a bowl, sprinkle the jelly crystals and stir until crystals dissolve. Add lemon juice and couple of drops of yellow food colouring. Cover and place in fridge until the jelly has an egg-white consistency. Place the dessicated coconut in a soup plate, dip a piece of sponge into the jelly, ensuring it is completely covered with the mix and then drop it into the saucer to coat it in coconut. Transfer to a dish or plate. Repeat with remaining sponge and coconut. You can also serve them in paper cupcake liners. Garnish with jelly lemon slices and mint leaves if you wish.